As Olmert continues making feeble efforts to reassure Israelis that an agreement with the PA that will surrender yet more territory including around the nation's capital as launching pads for mortar and rockets attacks will not endanger them, Millions of shekels have been spent fortifying the Prime Minister's Office against rocket attacks. While Olmert makes empty promises, the work continues to begin transforming the Prime Minister's Office into a bunker against the disasters that his policies bring. A man who makes extensive concessions without understanding the consequences is one thing. A man who not only understands what will happen but prepares to protect himself while leaving the rest of the country out in the cold has many names, traitor is only one of them. Where Rabin promised that 97 percent of Israel could be defended, Olmert is reduced to saying that not all of Israel can be defended. Apparently the one part of Israel that can be defended is the Prime Minister's own Office. With the Prime Minister's Office being fortified, perhaps the residents of Sderot, Gush Katif and those in Yehuda and Shomron slated to be expelled can move into the Prime Minister's Office instead. When Olmert arrived for a ceremonial menorah lighting at an IDF base he was met with protest pickets outside and a cold reception from the soldiers. No one applauded and in silence, Olmert mumbled that he understood their situation and identified with them. On the next day PA policemen opened fire on IDF soldiers. They may not have done it with the rifles and ammunition Olmert agreed to allow through to them, but that is cold comfort. The soldiers in whose supposed name Gaza was made empty of Jews are still on the firing line, only the firing line has moved closer. Defense Minister Barak, who oversaw the disastrous retreat from Lebanon leading into the second Lebanon war, is drafting a bill to "compensate" those living east of the separation wall, a usual first step leading up to forcible expulsions of tens of thousands of Jews. There will of course be no compensation but there is meant to be an expulsion and so the same lie is being recycled yet again right out of the wash.
And even as plans continue to be made to dismantle the State of Israel, new discoveries are constantly being found, from Nehemiah's wall to portions of the City of David. The earth rumbles in an earthquake and legacies of Israel's glory and rebuilding are unearthed to the surface as if the land of Israel itself is pleading with her children to preserve her by reminding them of days gone by. It is telling that Annapolis came before Chanukah, the holiday that commemorates the Jewish rejection of tyranny, both by foreign empires and by their own secularized brethren determined to sell out their own people, religion and culture. 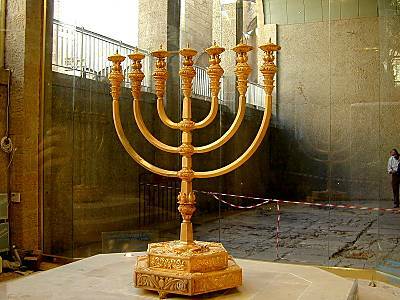 In Chanukah, the Maccabees rose up against a Greek and Jewish elite that was determined to create a New Middle East. The Jewish elite in Jerusalem had chosen to be Greeks rather than Jews, to embrace Hellenistic culture and to transform Israel into another Hellenic province. The Maccabees rejected that vision in favor of preserving Israel as a Jewish nation serving G-d and went out and fought for it. Every treaty and conference from Oslo to Annapolis has been an attempt by the modern Hellenistic elite in Israel to reject Chanukah and turn back the clock, to reimagine Israel as a secular middle eastern state under the protection of the EU and America and to give up land, security and nationhood in the pointless pursuit of that goal. Two visions of Israel remain, that of a strong nation that abides by its roots and remains staunchly attached to its heritage and a schizophrenic banana republic whose leaders constantly rise and fall while competing for the privilege of giving away their own country to the first turbaned butchers who changes into a suit and promises peace while fondling a knife behind his back. This Chanukah and for as many Chanukahs as we have left, the choice will be made and the lot will fall. The Dreidel spins. Will it be Nun Gimmel Heih Pey or Nun Gimmel Heih Shin? Will it be a great miracle that happened there, as we sit in exile trying to make the best of a bad situation or will it be a great miracle that happened here in our own land? As in the original Chanukah, the choice is ours. Corrupt leaders only rule because they are tolerated, because they are obeyed and go unchallenged. That too is the lesson of Chanukah. Freedom is our heritage. Lihyot Am Hafshi Be'artzeinu Eretz Tziyon Ve'Yerushalayim. But freedom is not given, it is taken. The Maccabees refused to allow the corrupt leadership in Jerusalem to speak for them. Had they not, the second exile would have come much sooner than it did. The fact is that Sharon used Kadima to illegitimately take power in violation of Israeli law, in which the party achieves victory rather than the individual. Olmert is opposed by the vast majority of Israelis. This sitting government has neither authority nor legitimacy. It only has force and force is finite while the fear of force is infinite. Force can be overcome but first the fear of force must be overcome, with faith in G-d, with love of your brother and love of the land. If he creates a bunker for himself he can hide in it like hitler and bin laden do. Choice company for Olmert. And he builds a bunker when all he really needs to do is atone for what he has done and turn (?back) to Hashem. Eyn imglik iz far im veynik. A meshugener zol men oyshraybn, un im araynshraybn. Zol es im onkumn vos ikh vintsh im (khotsh a helft, khotsh halb, khotsh a tsent kheylik)!Er zol hobn paroys makes bashotn mit oybes krets. 3 and say: Thus saith the Lord GOD: Behold, I am against thee, O Gog..
that have gotten cattle and goods, that dwell in the middle of the earth. I just read this again. Hmm. Very astute to notice that Barak is offering compensation as a prelude to expulsion. As with Sharon this compensation will probably involve a heavy PR campaign, promises of temporary jobs, $300,000 for their homes (yes, I am still waiting to see if ANYONE from Gush Katif or the other settlements ever got that money). And no doubt if they're forced out they'll also be forced eventually to pay rent on the little trailers they're living in. Also, there is a must-see video about the explusion called Never Again which is being censored by the media. It includes a clip of Sharon's commercials that ran on Israeli TV. It's in Hebrew with English subtitles and runs about 11 minutes. I don't care how many times one tries to spin it, 2+2 will never equal anything other than 4. 4 is the only answer. So why give away more land to the ingrates who only use it to blow Israelis up. Massive Memo to UN: Quit being absurd! What do you have to say about the palis consistently bombing Israel? How come the rest of the world is crying over these people who have done nothing to help themselves out of their miserable situation? It is absurd to side with terrorists!